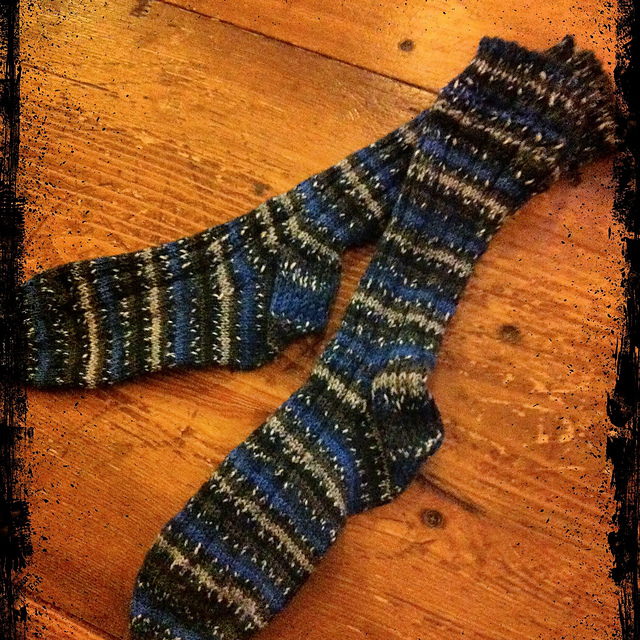 Apple Jack Creek: socks, done! I had the luxury of being a passenger during a day run to Jasper this weekend (many thanks to my friend who did the driving! ), and so I got the second sock done very quickly. They’re somewhat different than the pattern though not much … I did only two repeats of the cuff patterning as the yarn was hiding the stitches, so there wasn’t much point doing more. The ribbing is great, makes for nice shaping and stretch through the sock, and I love the toe design … easy to do and very simple and smooth when finished. Pattern is Spey Valley, from Nancy Bush’s book Knitting on the Road.